Since joining Freidman, Suder & Cooke in 2010, Glenn has become a veteran commercial litigator and an integral part of several trial teams, helping earn significant victories in multi-million-dollar disputes for his clients. While Glenn’s practice focuses largely on business and corporate litigation, he also offers valuable experience in several other fields including intellectual property, sports and entertainment, oil and gas, trade secrets, real estate, private finance, as well as many others. Glenn’s experience with these cases has ranged from settlement, to trial, to post-trial appeals, and even includes experience at the highest level, the U. S. Supreme Court, where Glenn played a critical authorship role in securing new law on behalf of a client in 2015. Similarly, in late 2016, Glenn was the lead attorney on a brief submitted to the U.S. Supreme Court that again resulted in a win for his client. 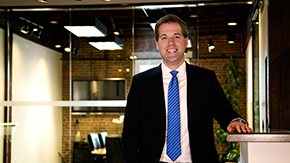 Additionally, thanks to a unique background in the world of professional sports through his time as an intern with the NFL’s Atlanta Falcons, Glenn also has assisted several small sports businesses with their legal needs over the course of his career. Glenn’s hard work and straight-forward approach to litigation has garnered him significant recognition amongst his peers and in the industry, as he has been named both a Top Attorney and a Super Lawyers Rising Star on multiple occasions. Whether through trial, licensing, or settlement, Glenn is consistently able to find the best and most cost-effective solutions for his clients while achieving the best results. Outside of the office, Glenn is passionate about his alma mater’s football team (the University of Georgia), his rescue golden retriever, barbeque, and live music.